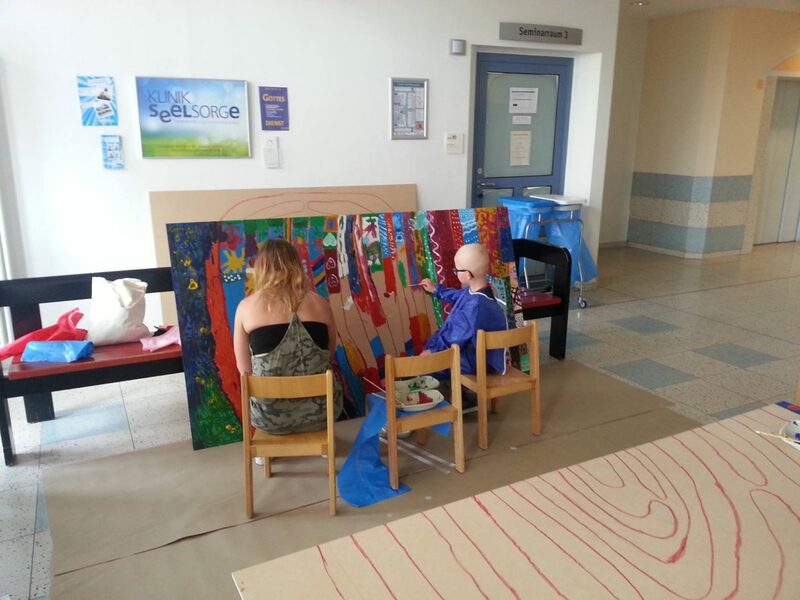 Art in the children's hospital - KRASS e.V. In the children’s clinic foyer of the University Hospital of Düsseldorf, a labyrinth is created. The children of all wards design the 3-piece work to the extent of 4m × 1.50m. After completion it will hang in the entrance area and embellish and enrich the path into the children’s clinic. Until then intensive work is being done developing the unique piece of art. The children leave their traces of color on the paths of the labyrinth supported by parents, clinic staff and the public. Work is done in an intense, special and connected atmosphere. Thoughts, which Mareike van Elsbergen (art therapy degree) has transcribed. How magically people are attracted to labyrinths. Children and adults often enter walkable labyrinths spontaneously and run the lines. This labyrinth is to be done with the eyes and other senses. The path is designed by the children of the wards of the University Clinic Düsseldorf. The children have left their tracks in the context of a symbol that has left its mark on our cultural history for at least 5000 years. With brushes and acrylic paints, the labyrinth was further developed on several project days. The labyrinth can be understood as a symbol of the way of life. In his center we can discover ourselves. Those who follow the labyrinth encounter breaking away and letting go, the turns that lead us back to the knowledge in the middle and the way out again. The labyrinth as a place of encounter. All who are connected with it, follow a map of the soul. Following the labyrinth is like a journey to one’s self.